Last year Ig Publishing approached me to write a book on the issue of combat PTSD in our returning OEF/OIF troops. I'd been blogging for a few years, but had never written a book before. As any writer I suppose I'd wanted to write a book eventually. Someday. When I had more time. When I knew what to say. And how to say it. I thought I'd write of my father, who fought on the streets in Budapest during the Hungarian Revolution of 1956. I'd call it, "Revolutionary Daughter" or something lofty like that. I'd even started interviewing my parents and buying books on the topic to begin my research. But did I think I'd ever really write a book in my life? Really? Well, it's real. I've written a book. Just not that book. 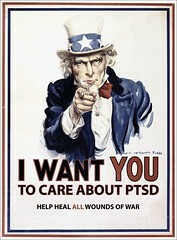 No, my book is called Moving a Nation to Care: Post-Traumatic Stress Disorder and America's Returning Troops. Nothing lofty in that there title, eh? Read about Thursday's Boston area signing in the full write-up. Or listen to a 15-minute interview I gave to Charlotte Crockford, 91.5 FM WUML. Tomorrow, I head out to Philadelphia for my second book event [Facebook invite]. On Friday, May 18, I'm at the Barnes & Noble in Greenwich Village [Facebook invite]. If you are in Philadelphia or New York City, please come! Meanwhile, as the tour moves forward, everyone else's preordered books are still waiting to be delivered. I am sorry about this, guys. Our days of delays, however, will soon be behind us! I'm told the books have been shipped from our distributor's warehouse; Amazon should have stock in the next few days as should bookstores that have ordered some. (A pre-ordered copy at my local Borders store arrived a couple of days ago; and Barnes & Noble is now offering the book for sale, not preorder. So the books are finally winding their way through the system. YEAH!) Thanks for all of the patience on the delays. It's been disappointing on this end, too; but, my publisher made sure all of our events are adequately stocked. Come out to a signing and get your book before everyone else! Those who participated in the Buy One, Get a Signed Copy Free promotion, your books went out via First Class mail today. May even beat Amazon.com! But what does all of this have to do with The Rumsfeld Revolution in Military Affairs? Well, everything, of course. Tonight I present the debut of Moving a Nation to Care's sample chapter. Please leave your thoughts on Chapter 6. More comments here.